De Haan town centre has acquired a special place in many holidaymakers’ hearts. Here you can still find that perfect holiday atmosphere with its picturesque residential neighbourhoods built in famous Belle Époque style, or by taking a walk along a typical dyke while you savour the vast green landscape… Because there are no high-rise buildings here, De Haan has a certain distinguished appearance. Would you like to go back in time? Then you must definitely walk through the 'Concessie' in De Haan-Centre. Almost all buildings date back to the Belle Époque period. 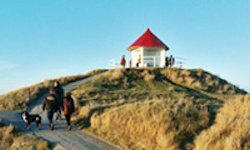 De Haan is thé holiday paradise by the sea for both young and old! De Haan proudly claims to have the most beautiful dyke along the Belgian coast, ideally suited for walking. Add the beach (no breakwater! ), the dunes and woods, and you have the perfect mix for a perfect holiday. And what tastes better after a vigorous walk than a menu of fresh fish and other local specialties? De Haan has excellent restaurants for a culinary trip. The 'Spioenkop' is a quaint little cottage, which serves as a lookout from the top of a high dune, providing a fantastic panorama of woods, dunes and sea. 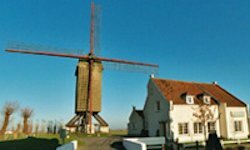 Wide horizons, typical polder skies and a picturesque village heart will make you feel welcome. Stroll along the polder farmsteads, breathe in the wonderful country air... enjoy a reviving holiday! 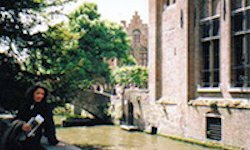 At 28-km distance you'll find historical Damme, also accessible from Bruges by boat. Entertainment parks like Boudewijnpark (Dolphins), Bellewaerde and Plopsaland will most certainly appeal to the very young. In Blankenberge there is the Sea-Life Centre, as well as the pier. In Jabbeke you'll find the Permeke museum and in Gistel the Ten Putte Abbey. 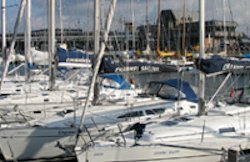 There is a 'Seafront' in Zeebrugge, where it is possible to discover the secrets of the sea. Make sure to visit the stylish Knokke with neighbouring Zwin. Ostend: the Mercator ship is a striking attraction and the Kapelstraat, a well-known spot for the shopping public. The Prins Karel estate near the airport is the place to visit for war memorials. We also recommend a visit to Fort Napoleon and the Ensor museum. 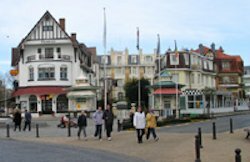 You can take a day trip to London from the port of Ostend.